Have you ever felt truly confident handling your paintbrushes? No? Want to learn how to be? Imagine knowing exactly what your brushes will do in any given circumstance. Imagine the freedom this knowledge will give you to create your own beautiful paintings! is the next ebooklet in our series! 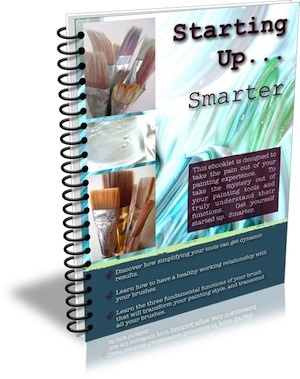 Following on from "Setting Up...Smarter", our 29 page ebooklet guide focusses on building and investing in your relationship with your paintbrushes. there are practical tips in here for all of us. Knowing your brushes intimately = confidence in your ability to create great paintings! Download the First 3 Pages Right Here **FREE*!!! ✔ Three fundamental functions that will apply to every paintbrush you will ever use. ✔ Practical, fast and inspiring exercises to cement the theories. ✔ Why a healthy understanding of your brushes is essential. Make paintings with gusto and confidence. ✔ Develop skills and techniques that will transform your paintings forever. ✔ Don’t spend a fortune to get the results you want! ✔ Get the answers you need when your brushes just aren’t working for you. ✔ Powerful, simple exercises to establish skills and motivate. ✔ Recognise the potential and capabilities of your brushes. ✔ Enhance your paintings through developing simple skills and techniques. ✔ Basics of brush behavior. ✔ How to use an appropriate size brush for your needs, and why this is important. ✔ Limit your brushes and know them intimately before branching out. Simplify, simplify, simplify! ✔ Learn which questions to ask to find the answers you need. Being at one with your painting processes is one of the most magical experiences. These strategies have helped me get there - and they’ll work for you too. Ever wanted to go into a painting without the background clutter? Setting yourself up to paint freely is something you need to be thinking about.